Manish Malhotra unveiled his ‘Tales of Indulgence’ to the audience and gave them the opportunity to experience his extravagant display as he launched his bespoke menswear and women’s cocktail and festive lines. He brought a mélange of evening-wear, club and occasion wear with bespoke suits with details such as baggy pleated pants with ruched ankles, long velvet coats, embroidered lapel jackets, collarless jackets with embellished sleeves and double-breasted velvet numbers with fur accents. Manish’s womenswear with crystals, sequins and zari work along with giant beaded tasselled accents made dramatic style statements. Corsets were a popular choice, teamed with feathered skirts, slit gowns, ornate lehengas or as minis with long shoulder capes. Inspired by an early era of 1950’s, De Belle‘s line aimed at making the woman of today as beautiful by blending Western and Indian designs with a range of textile fabrics and silhouettes. Representing the revolution in the mindset of women were bold motives of flowers that created a playful role. A touch of the retro revolution was witnessed in the form of trench coats, short jackets with puff sleeves, boleros, waistcoats and extreme shoulders with bold oxidized embroidery. Bringing the glow in the dark element, Faabiiana‘s silhouettes were inspired by moody, moonlit florals blended with hues of ash rose and blush to show the lighter side of the day. Enjoying this concept of the beautiful changes of day and night, the line was an amalgamation of offerings such as delicate zardosi intricately fused with Mukaish, Chikankari, Gota and Aari work. Inspired by mythological characters, Hardika Gulati‘s collection, focused on “Sita” and “Draupadi” renowned as the icons of Indian womanhood. With silhouettes inspired by the 60’s, the range showcased strikingly avant-garde ensembles. Creating a blend of new techniques and classics were suiting textured fabrics like checks with a woollen blend progressing to Neoprene. Glitter was scattered to add shine to the otherwise matte fabrics. Taking inspiration from nature, Ruceru‘s line created a mood of chaotic silence that connected to the spirit of womanhood. Highlighting the similarities between the ensembles and the season, the idea showed “growth and fall” in a mesmerizing manner by minimising embellishments to allow each piece to stand out. 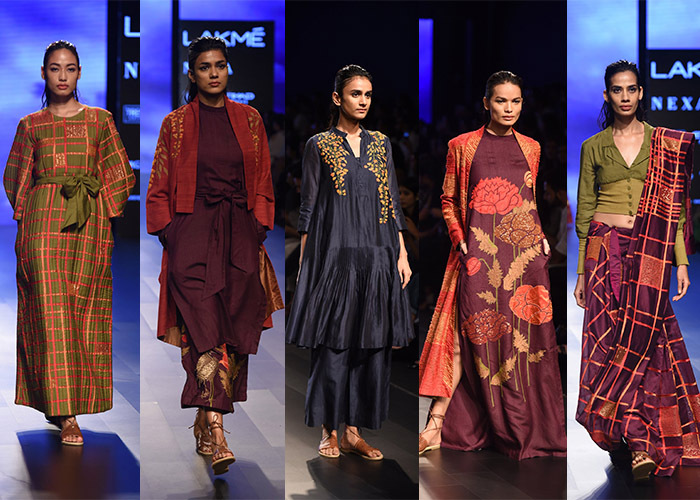 The designers opted for fluid fabrics like silk, tissue, Chanderi, Habutai, raw silks and silk organza, dyed in an autumnal colour palette of beige, brown, olive and warm red that gave the garments an edgy and intriguing appeal. 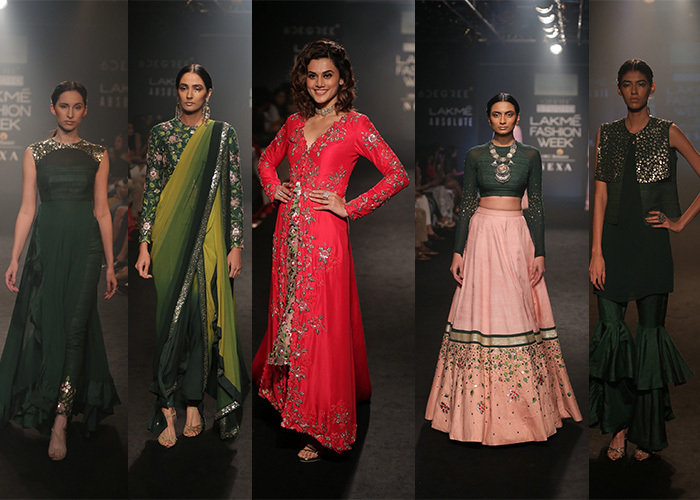 Jayanti Reddy threw a variety of silhouettes out on the runway ranging from lehengas, jackets, shararas, blouses, shawls, tunics and pants. The use of heavy ruffles and exaggerated tassels added to the royal touch. 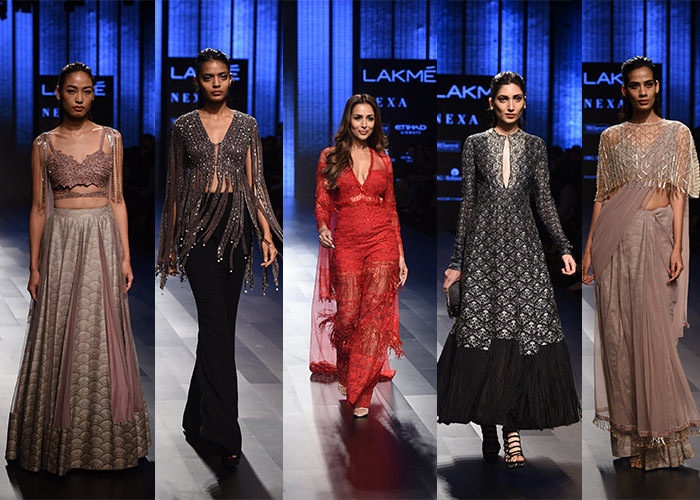 Divya Reddy’s festive wear included layered, frilled maxi skirts worn with matching body-hugging, long-sleeved, embroidered cholis, along with lehengas with abstract designs. 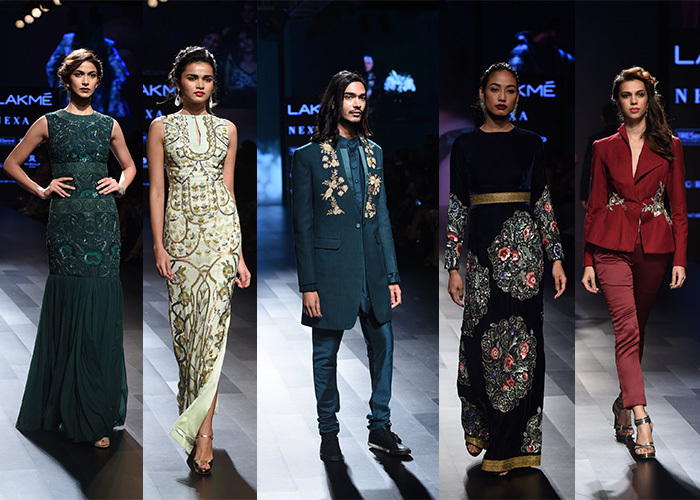 Narendra Kumar took to storytelling on the ramp with a moving tale titled ‘The Marriage of Shayla Patel’. The collection was unveiled with every turn of the story and introduction of a new character, keeping the audience gripped to the stage for both, the clothes as well as the narrative. From Ivory gowns to anarkalis to jumpsuits, his all-inclusive line had multiple options for not just the bride but the entire family. Sonaakshi Raaj paired an all-black dhoti inspired sari with a matching cropped blouse with PVC at the hem. Tailored, off shoulder party pieces added variety. Shriya Som experimented with bodycon creations, shifts and midi dresses with ruffle detail along with crop tops, pantsuits, cocktail gowns and faux fur jackets. Amoh by Jade gave the audience an exquisite selection of garments perfect for special occasions. Ranging from well-tailored corsets and capes to floor length sheer jackets with scallop details, there was something for everyone. Arpita Mehta’s collection was glamorously replete with thread work, 3D appliques and sequins. 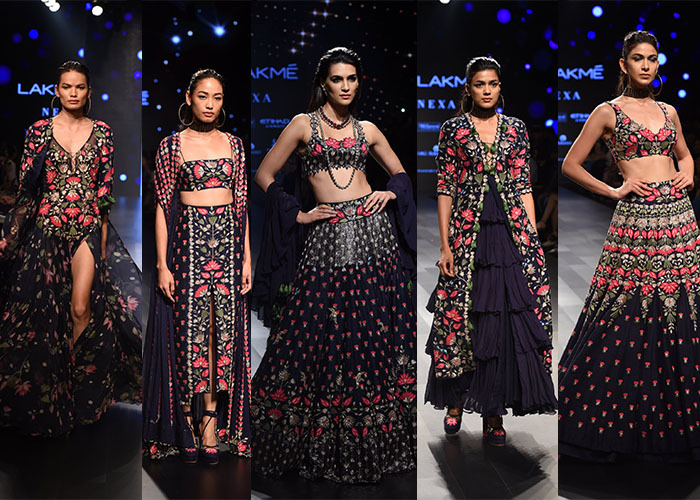 Ultra-feminine silhouettes in silks, chiffons and georgette were rendered with bird and lotus motifs. 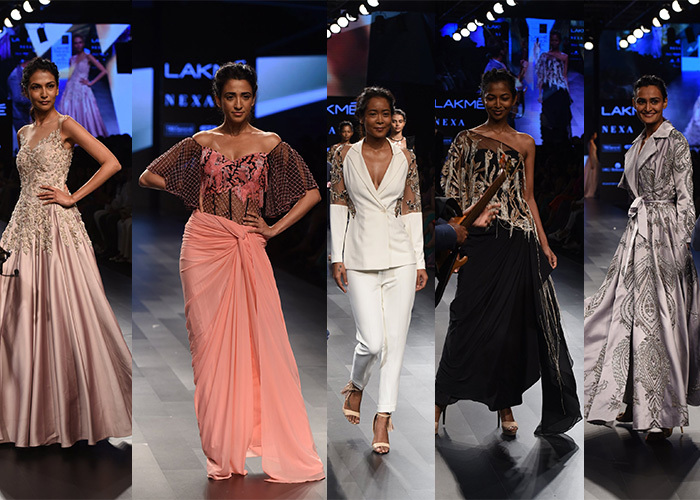 Slip dresses, constructed jackets, pleated palazzo pants and ruffled floral lehengas made it a wholesome collection of festive wear. 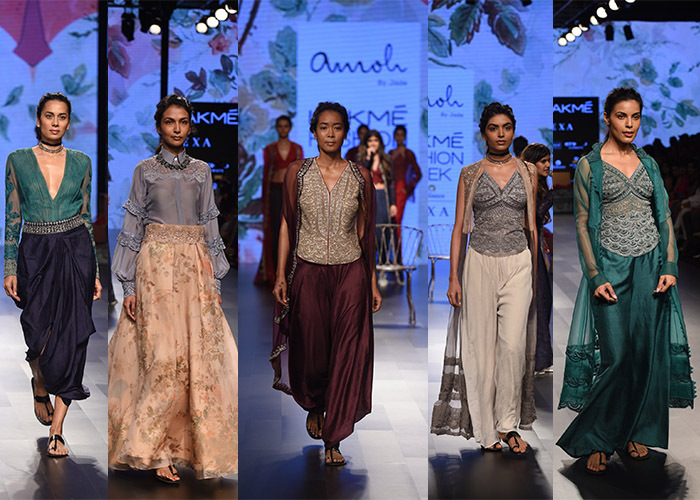 Ridhi Mehra’s minimalistic and understated design aesthetics made for a sophisticated demi-couture collection. 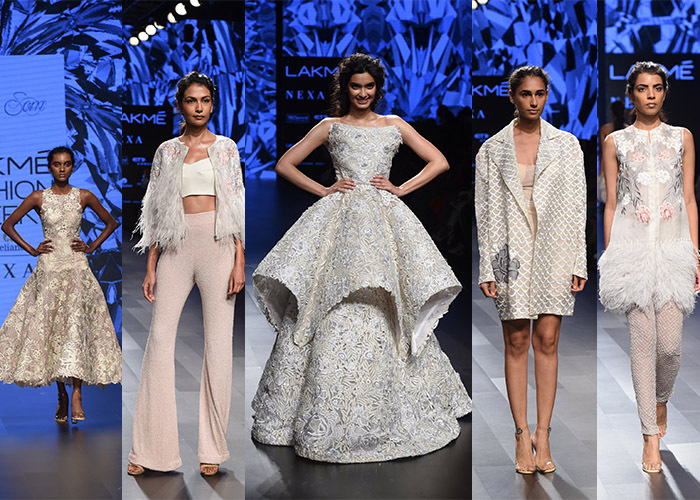 Crafted with the bride and her entourage in mind, the collection was a study in prints and embellishments. Details such as Bugle beads were turned into jaalis, and scallop print patches, fringes, and fabric tassels added oomph to the ensembles in shades of midnight black, ivory, champagne and millennial pink to name a few. 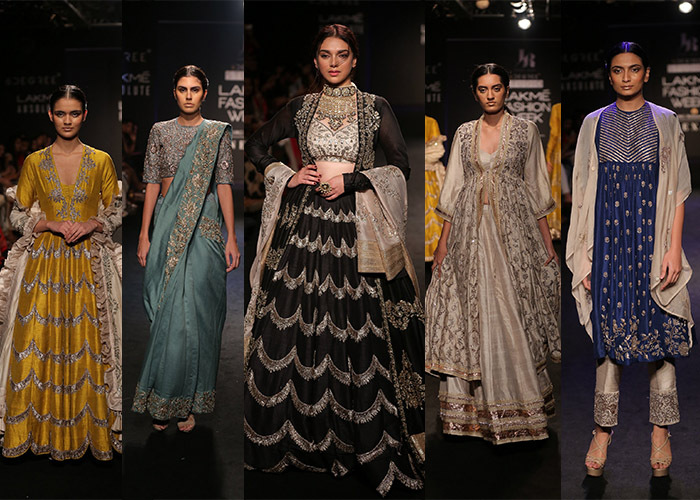 The Sukhavati line by Vineet Rahul was captivating in its use of Chanderi and raw silks. The duo presented a line-up of trench coats, asymmetric jackets, contemporary kurtas, saris with nouveau blouses and layered separates, all in line with the brand’s signature vibe.